RMS QUEEN MARY, luxury cruise liner turned moored tourist destination.. The famous British Shipping company, White Star Line, had a wee PR disaster in 1912 when its luxury passenger liner, the RMS Titanic, sunk to the bottom of the North Atlantic. Suffering its own troubles was White Star’s major competitor, Cunard Line. The two companies merged in 1934, and, together, they sent the Grand Poobah of luxury liners a-sailing. Behold the Queen Mary. The Queen Mary, who took her maiden voyage in 1936, is nearly twice the size of the Titanic. She traveled at 35 mph, a speed fast even by today’s standards. She guzzled gas like no other. 13 ft. to the gallon. It took her four days to cross from North America to Europe and, for nearly 30 years, she dominated the seas. During her heyday, she serviced a who's who of celebrity and political passengers, including Liberache (who once ordered his piano brought to 3rd class, so he could perform a free show), Fred Astair, Bob Hope, Audrey Hepburn, Winston Churchill. A first class ticket cost the equivalent of $17,000 today. The Queen Mary lost her monopoly over transatlantic transport when commercial flight took hold, and she was retired from service in 1967. 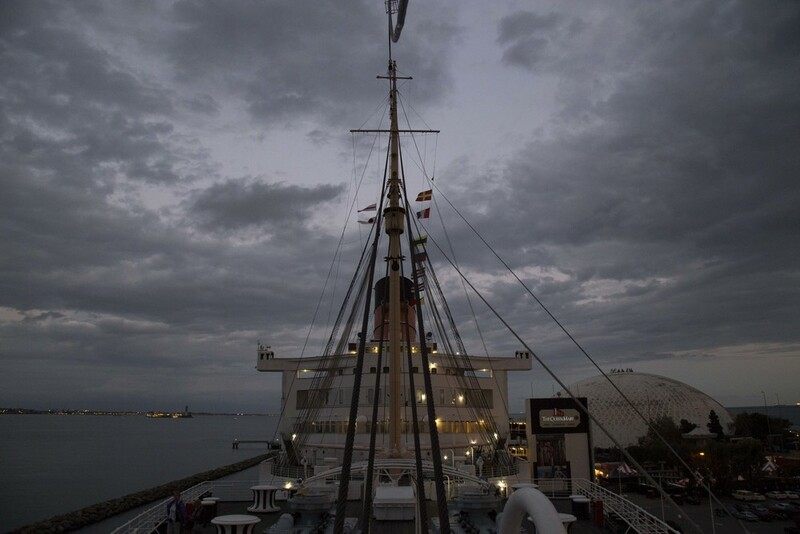 The city of Long Beach put in a bid for her at the bargain low price of 3.5 million (it cost about 80 million to build) and re-opened the ship as a hotel, restaurant and tourist destination in 1971. Thar she remains permanently moored! And awaiting your arrival. If you want to spend just an afternoon onboard Queen Mary’s decks, there are all sorts of ticketing packages to choose from. Initially, we chose the “First Class - Haunted,” but asked, after the first tour, if we could swap to the “First Class - Historical,” which turned out to be a more our speed. If you're into the paranormal and stories about ghost sightings, the haunted tour is great. 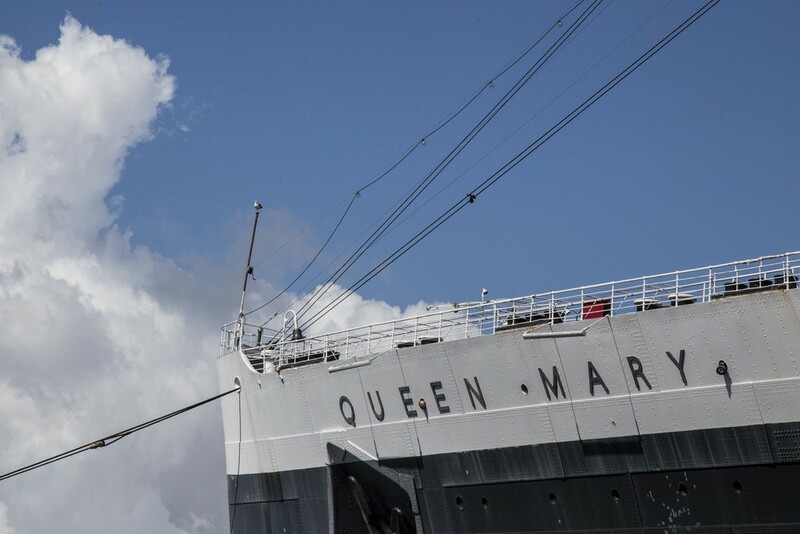 The Queen Mary is rife with sightings. The tour also takes you to some deeper recesses of the ship that the historical tour does not. You get to wind your way through weird little corridors with old dusty furniture stacked in corners, and into the bow of the ship, where you can look down a three story shaft that held POWs during the war. The historical tour takes you to the more elegant bits of the ship, and you hear stories about the ship and her famous passengers. The tour guides make the tours fun. They mix history with their own brand of bad dad jokes that are funny, because you’re on a giant, haunted, historic ship and you’re in a happy, laugh-ready mood. You’ve also maybe had happy hour whisky on the restaurant deck. Regardless of what tour you choose, go exploring on your own afterward. 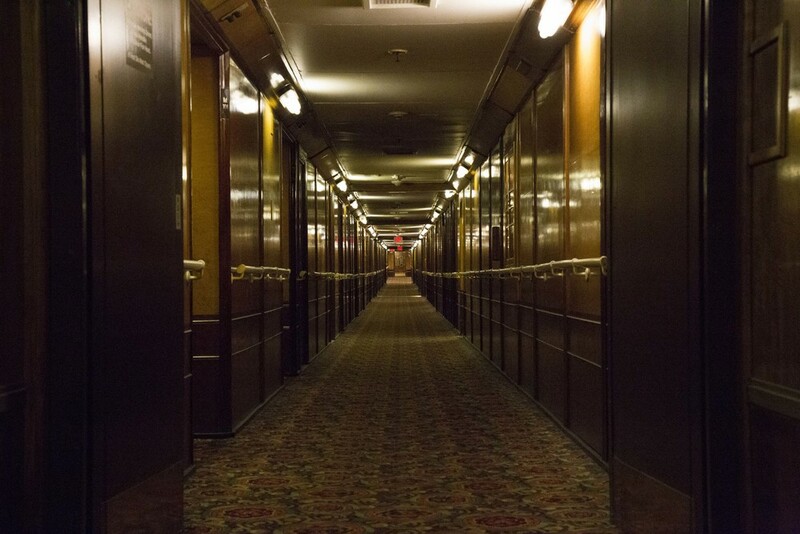 Nose around the indoor hallways and poke around the 12 decks. Be sure to head for the bow of the ship when sunset hits. Maybe you’re not supposed to, but nobody seemed to notice us climb to the very front area of the ship (we’re of the mind that if there’s no sign to say “Don’t,” climb climb away). It is the best spot to watch the sunset. Before you buy your tickets, check Groupon. That’s where we got ours, and it was half the price. Parking at the lot for the Queen Mary is $18. If you want to not spend that, use public transit. It’s an experience in and of itself. Take the Blue Line to the Long Beach Transit Mall stop, then hop the free Passport bus - Route C.